A godparent is responsible to fill an important role in the life of a Catholic child. Being selected as a godparent is an honor that carries with it important responsibilities. Catholic etiquette dictates several criteria necessary for someone to be eligible to be selected as a godparent. Even more important to consider is the etiquette pertaining to the role a godparent will fill in the life of a young Catholic child. Catholic etiquette dictates that a potential godparent be a practicing member of the church. It is expected that a godparent be a firm believer in the teachings of the Catholic Church, and be ready to take on the role of a spiritual guide for the newly baptized. Traditionally, the godparent is expected to be prepared to step into a parenting role if the natural parents become unable to do so. This is a concern that should be discussed in detail with the child's parents before you agree to take on the responsibility of becoming a godparent. Etiquette states that you should prepare for the baptism ceremony by attending the scheduled meetings with the parish priest and the child's parents, if possible. You will learn not only what the expectation is for you at the ceremony, but what role you will fill in the child's life as his godparent. Consider purchasing a keepsake gift for your godchild, such as a Bible, a cross, or a small statue to symbolize your devotion to the child and your dedication to your role in his life. You will be asked to stand in the church with the parents and the child as the child's sponsor and to bear witness to the sacrament. After the parents present the child to the congregation and state their request for baptism, you will be asked if you are willing to help the parents raise the child in the practice of the Catholic faith. You will be an integral part of the ceremony, assisting with the lighting of the candle and witnessing the cleansing with holy water. 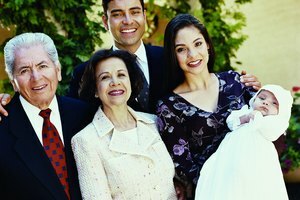 A godparent's responsibilities extend far beyond standing with the family at church. A godparent is expected to be a spiritual guide for the child. Whether the child is a blood relative or the child of a close friend, the expectation is that every effort will be made to get to know your godchild well and help the parents by sharing your faith with the child in every way possible, from the day of the baptismal ceremony to all the days beyond. Ryan, A.J.. "Catholic Etiquette for Godparents." Synonym, https://classroom.synonym.com/catholic-etiquette-for-godparents-12084955.html. 29 September 2017.